In 2018 and for the foreseeable future, online advertising is a huge business, taking into account that the global digital marketing industry is over $190 billion this year alone and the affiliate marketing industry is on its way to a whopping $7 billion dollar industry. With this type of huge market, fraud is bound to be apparent. And it is, almost more than any other industry. In fact, digital ad fraud takes $1 out of every $3 that is made through online advertising.When you consider the scale, this is a significant amount of stolen profits being committed everyday by fraudsters. Individual affiliates, advertisers, affiliate & ad networks, DSPs, and RTB traffic platforms are all at risk for ad fraud and most likely already suffering from it to some extent. Digital ad fraud is certainly nothing new to the industry, it’s been thriving for well over a decade. However, fraudsters are continuously using more advanced tactics to bypass fraud filters and fly under the radar. It’s important to understand the different types of ad fraud so you can know how to best prevent them. Who wouldn’t want to stop ad fraud right? Especially when proactive protection could save thousands of dollars per month in wasted ad budgets and give you and your customers a greater peace of mind. Let’s discuss the various types of online ad fraud and how you’ll be able to fight back against them! Click fraud is the leading cause of fraud in the digital ad industry, accounting for the majority of the billions in wasted ad budgets each year. Tactics for click fraud are broad but can include competitors clicking on ad budgets to deny the opportunity for legitimate prospective clients to see the ad. More often though, publishers are using bots and non human traffic to automatically inflate their clicks, which they are then compensated for on a pay per click or pay per impression basis. Preventing click fraud is the best approach for dealing with it, as it truly is a never ending battle with fraudsters. The weapon of choice for these fraudsters are proxies and VPNs which can mask the user’s identity and location. A single user controlling a botnet of infected computers can posses millions of unique IP addresses to generate clicks or impressions spread out over days, weeks, or months, making this type of fraud very difficult to detect. Typical fraud rates for PPC traffic can vary between 20% all the way up to 40%. Meanwhile, smartphone click fraud rates have risen over 102%from last year alone. This level of fraud is devastating for companies of all sizes. Mobile apps have taken over the affiliate industry in the past few years and mobile traffic continues to significantly grow year over year. Fraudsters are seeing this as a huge opportunity to focus their bots and efforts into creating fake installs from devices that appear to be unique. Mobile install fraud for 2018 has already exceeded 1.5 billion and is on track to reach beyond 3 billion by the end of the year. Install fraud hurts everyone in the marketing channel, from the individual affiliate buying traffic infected by bots, to the affiliate network which may lose advertiser relationships or face reversals across all of their publishers, and finally for the direct advertiser which often pays for fake installs without knowing it. In an ecosystem where many publishers receive profits based on impressions or pops, there are dozens of ways fraudsters are taking advantage of this model to wrongly game the system. For instance, when viewing a simple banner ad that links to a single website, fraudsters can layer several ads on top of each other, distributing and charging for all of them, while only the ad on the surface can be seen. Similarly, fake bots and automated scripts can create thousands of fake pop impressions per hour from unique IP addresses. Ad fraud costs big money but it also consumes a significant amount of time to manually review accounts and traffic sources to control quality. 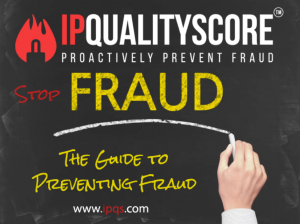 Fortunately, IPQualityScore offers a wide variety of fraud prevention tools that are designed to not only detect fraudulent behavior, but prevent and block it altogether. IPQS’ device fingerprint detection is an unparalleled fraud detection service capable of detecting even the most advanced fraudsters and spoofing techniques. It does this by taking a digital “fingerprint” of each device that accesses your platforms and assess their potential fraud risk, all in real time. By collecting over 200 identifying data points from each individual user on the spot, a unique device fingerprint is generated and analyzed to produce a fraud score. This score indicates the likeliness of the user to engage in fraud, based on comparing their device profile and behavior with established patterns of fraud. This allows marketers to easily catch high risk users as they click through an ad or affiliate link to completely prevent ad fraud. Device Fingerprinting can also be deployed on other funnel pages such as a registration or checkout page to catch fraudulent users. This tool is especially useful for detecting duplicate accounts as it can track users as they move through your site, even as they change their browser, IP address, and other settings that could be used to identify them. The best protection is in real-time, which is why IPQS provides real-time fraud scores for clicks and impressions, so you can redirect high risk traffic to less sensitive offers or to alternative sources of monetization. Fraud scores are calculated based on IP reputation, device reputation, and similar factors that help us identify patterns of fraudulent behavior. IPQS’ fraud scores are an easy way to identify high risk traffic. Calculating average fraud score rates for a specific traffic source or publisher can make it simple to cut the high risk sources of traffic or give those sources extra scrutiny. Similarly, lower risk traffic sources can be easily identified and scaled up to maximize earnings! VPNs and Proxies are tunneled connections that can easily disguise a person’s online identity. While these can definitely be used for legitimate and justifiable reasons, a large majority of criminals and fraudsters will employ proxies to carry out their fraudulent behavior. By identifying and blocking proxies and other low quality connections, you’ll be able to reduce the amount of fraudulent traffic that visits your desktop and mobile ad campaigns. A simple API query from IPQS can provide connection details, an overall risk score, and the type of proxy or VPN detected. This tool is incredibly useful for filtering traffic in real-time. This tool is especially useful for advertisers and companies focussed on lead generation. Ensuring that the leads you are paying for are truely valid can save big money and frustration down the road when it comes to validating your data. Verify an email address has an active inbox with the mail service provider. Detect if an email address belongs to a temporary or disposable service (most commonly used for fraud). Cleanse newsletter and promotional lists. Extract other useful data, like the status of deliverability, role-based identification, and usage rates. IPQS’ Email Verification service goes beyond standard email verification to verify difficult catch all emails, detect the newest disposable and fraudulent emails, and accurately verify emails to a much higher degree than similar services. While ad fraud is a huge concern for companies in almost every niche online, thankfully, ad fraud can be successfully fought and prevented. Using the right mix of anti-fraud tools, such as those offered by IPQualityScore, can entirely automate this process to save your team hours of work per day. Publishers, Ad Networks, Advertisers, and DSP/RTB platforms can take advantage of IPQualityScore’s anti-fraud services to automate quality control for both mobile and desktop devices. Test the service with your traffic on a free account that has access to 5,000 free queries every month or visit us at ipqs.com to learn more!